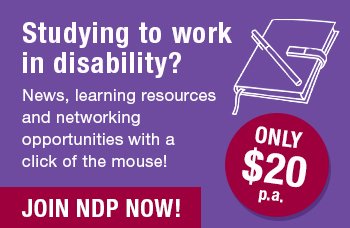 The disability sector has so much to offer! Whether you’re entering the sector, or you already work in disability and are looking to take the next step, carecareers' Career Planner shows you your options. You can find out the kinds of skills, knowledge and capabilities you’ll need for your dream job. If you’re looking for a new and rewarding challenge but are not sure what's right for you, take the carecareers' Career Quiz. It’s a fun and easy way to see what type of role would suit you best. You can now complete the career quiz in a range of languages. Interested in pursuing a career in the disability sector? Whether you are a student or a seasoned practitioner, carecareers' award-winning e-learning disability training program will help disability practitioners prepare for the National Disability Insurance Scheme (NDIS).